A few days ago, reminded by a recent The Guardian article (see below), I went looking for the 2013 government report on the WHB subpopulation (Lunn et al. 2013) at Environment Canada, just to see if it had been posted since the last time I looked. It had not; it is still only available in the form provided to Inuit groups in 2014 as part of community hearings. As a consequence, it was available to the public in 2014 but only if you knew where to look. However, my Google search last week revealed that a revised version of this report was posted at the US Geological Survey (USGS) website in June 2015, on the web page of report co-author Sarah Converse, with a July 2014 publication date. This American website appears to be the only place this 2014 version of the report is available. This study area map is Figure 1 from Lunn et al. 2013, 2014. The 2011 mark-recapture study (Lunn et al. 2013, 2014) did not include bears from Areas A or D, and only a few from Area B. The 2011 aerial survey (Stapleton et al. 2014) covered Areas A-D. This is why the estimate of 1030 from the aerial survey is considered the most accurate assessment. This is Fig. 8 from Lunn et al. (2013, 2014), the most recent report on the estimated size of the Western Hudson Bay polar bear population showing no declining trend since 2004. Click to enlarge. 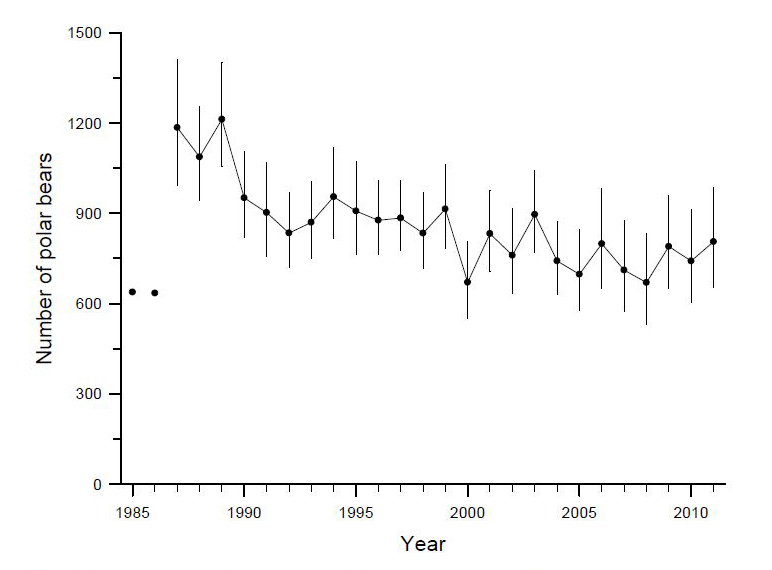 “Our updated analysis suggested that the growth rate of the WH subpopulation has, overall, been negative since capture‐recapture studies began in the mid‐1980s, and has been relatively stable over the last decade (Figure 8). The major driver of population change for female polar bears was the timing of sea ice break‐up and formation, which was correlated from year‐to‐year with survival of all age and reproductive categories of females, but not with annual reproductive rates (cub production and survival to first autumn). In contrast, the survival of male polar bears was not closely linked to sea ice, but was instead primarily a function of their age class. The matrix projection model results suggest that the lack of a negative trend in spring sea ice break‐up date from 2001‐2010 resulted in a stable female population, and this was generally supported by the relatively stable abundance estimates, suggesting consistency between these two different (but not independent) methods of inference. In other words, they found that sea ice conditions in Western Hudson Bay have been stable since 2001 and the population has also been stable. Survival of female bears correlated with changes in sea ice conditions but survival of male bears and cubs did not. 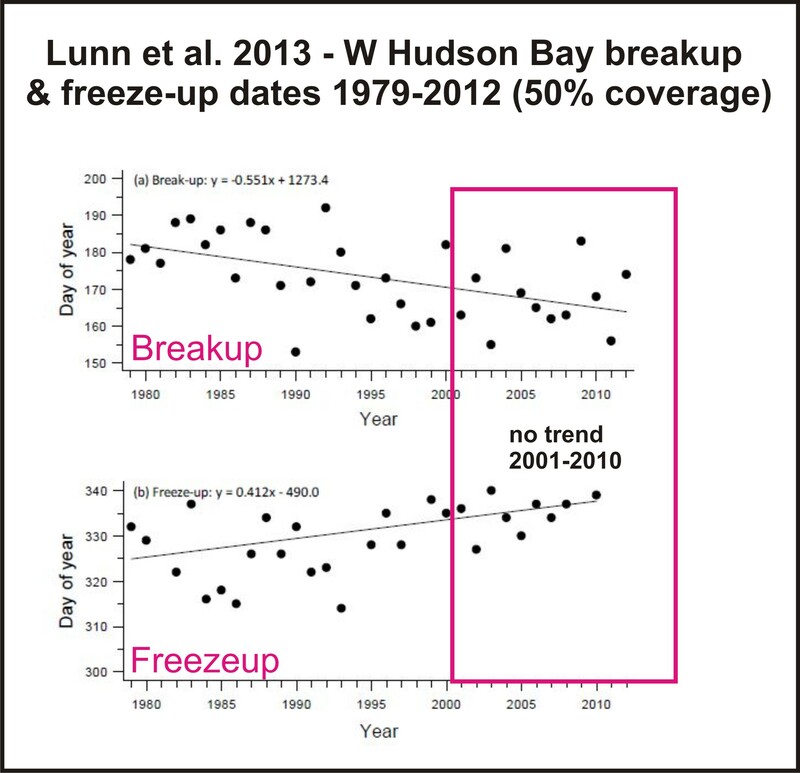 Sea ice changes were also not correlated with cub production. The study did not examine litter size or body condition correlations with sea ice. That means any comments made by polar bear biologists or activist organizations regarding current trends in body condition or litter size for Western Hudson Bay polar bears are conjecture or based on out-of-date information. Finally, note that this mark-recapture study did not produce a definitive new estimate of the size of WHB subpopulation. 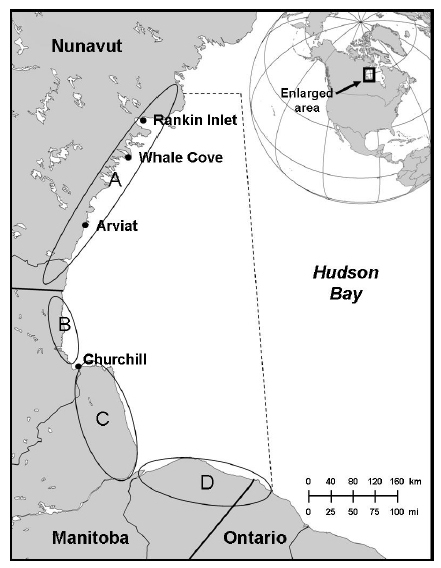 Their study surveyed only a small portion of the WHB population region (see map above) – it did not include animals from the entire territory as other studies have done. The Canadian government and the IUCN PBSG (see screenshot below) have chosen to use the aerial survey results (i.e., 1030) as the official WHB population size estimate because it was more complete. In other words, all that capture-recapture effort from Lunn and colleagues in 2011 did not produce results comparable to previous studies and as a result, it has limited scientific value. Which brings me to the next point – that another population estimate study is planned for 2016. My Google search also found a letter from Canadian Wildlife Service Director General dated 14 November 2014 (PDF HERE) confirms that 1030 is the estimate they are using for the WHB population and reveals that a new survey of both Western and Southern Hudson Bay polar bear populations is planned for 2016. 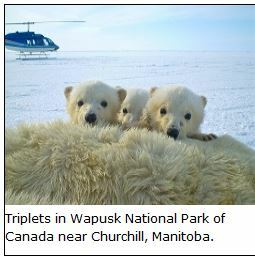 “As you are aware, the results of the 2011 Western Hudson Bay aerial survey have recently been published and provide a population estimate of 1,030 (95% CI: 715-1,398) bears. The Environment Canada study noted above reports a 2011 population estimate of 806 (95% CI: 653 – 984). While based on different methodologies, the overlapping confidence intervals of these two estimates indicate that they are therefore not significantly different. However, we note that the PBTC status table reflects the Committee consensus to use the 2011 aerial survey estimate of 1,030 bears. Which “other parties” will participate in the 2016 survey are not stated. 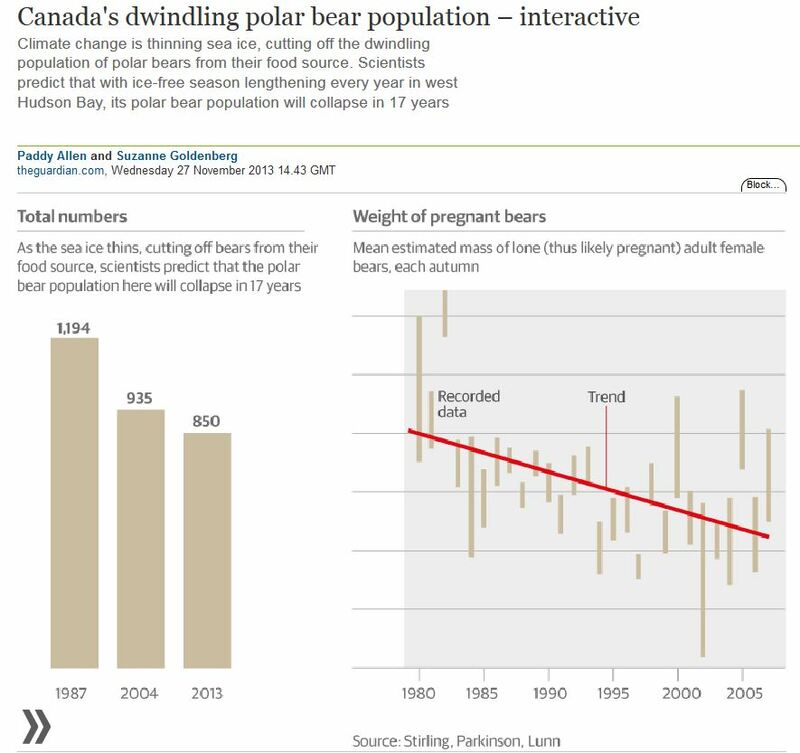 An associated story by Goldenberg (“Polar bear numbers in Hudson Bay of Canada on verge of collapse” 27 November 2013; backup here) also stated that the population size of WHB was 850 bears – a number which did not appear anywhere in the official government report (Lunn et al. 2013). It came from lead author Nick Lunn, who was quoted as saying the population size was now “somewhere in the ballpark of 850.” That’s suspiciously close to the 10% decline said to be “braced for” by polar bear experts (a 10% from 935 would be 842) – in other words, the number Goldenberg used was what these biologists predicted it would be, not what the study found it to be. Regardless, the official 2013 mark-recapture government report made it clear that the actual population estimate of 806 (because it used a different method than that used in 2004 and did not survey the entire population) was not a statistically significant decline from the 2004 estimate of 935 or from the aerial survey estimate of 1030. The Guardian graphic showing a declining trend is bogus. The official estimate for the WHB population, used by all scientific stakeholders, including the IUCN PGSG, is 1030. This means The Guardian used numbers that had no relationship to the official report although no one could tell that at the time since the official report had not been made publicly available. However, it is now clear that the 2013 Guardian article and its associated graphics were entirely false – and were known to be false when they were published — they need to be retracted and record corrected. This entry was posted in Advocacy, Conservation Status, Population and tagged aerial survey, breakup, freeze-up, Goldenberg, Guardian, Lunn, numbers, polar bear, population size, sea ice, Stirling, survey, trend, western hudson bay. Bookmark the permalink.